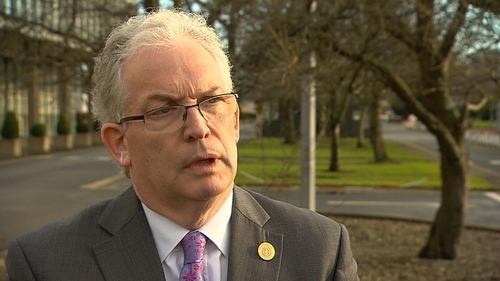 HSE Chief Executive Tony O'Brien has apologised to patients waiting on trolleys, saying the numbers were unacceptable. Speaking on RTÉ’s News At One, Mr O'Brien said the situation was not where the HSE wanted to be. He said that while the figures were too high, they showed a reduction, which he said was an example of the effectiveness of measures to tackle the issue. He said he was pleased that "we are now on the brink that we will see some changes in the future". Mr O'Brien said the healthcare system needed to be differently shaped and sized, adding there was political consensus on this and it needed to be addressed "because what we are seeing today will look like a picnic if we don't". He said extra beds needed to be matched with the recruitment of staff. The apology comes as the Irish Nurses and Midwives Organisation said there were 551 people on trolleys in emergency departments or on wards this morning waiting for a bed. The number is down from the 575 patients it recorded yesterday. The hospital worst affected is Letterkenny General Hospital with 43 people waiting. HSE figures show there were 420 patients waiting on trolleys in emergency departments this morning, but that figure was down to just over to 290 this afternoon. However, there were 57 people waiting more than 24 hours, which is higher than yesterday. The hospitals worst affected were University Hospital Galway with 42 patients waiting, Mercy University Hospital in Cork with 32 waiting and Tallaght Hospital with 30 people waiting. To ease the overcrowding in the past week, over 80 patents have been transferred from public hospitals to private facilities in Dublin and Cork. Yesterday, the daughter of a 94-year-old man, who spent more than ten hours on a trolley in the emergency department of University Hospital Galway, said she was shocked and horrified at the conditions there. The hospital overcrowding issue was discussed at today’s Cabinet meeting. Taoiseach Leo Varadkar said he did not want to see any patients spending time on trolleys and that no one should have to face the indignity and the risk to health that comes with prolonged trolley waits. Mr Varadkar said Minister for Health Simon Harris is to bring a bed capacity review to Cabinet within the next two weeks. He also confirmed that advertisements will appear in newspapers this Friday for the position of head of Sláintecare, the health service reform implementation office. The Health Information and Quality Authority has responded to questions about its role in the hospital overcrowding crisis, and said it does not have the power to regulate acute general hospitals and has no enforcement powers. SIPTU had called for HIQA to get involved in efforts to solve the overcrowding crisis. HIQA said it can conduct investigations, at the direction of the Minister for Health, under Section 9 of the Health Act 2007, or on the direction of the board of HIQA. The watchdog said that it had assessed the quality and safety of a number of emergency departments in recent years, including at Tallaght, Limerick and Portlaoise. "These findings and recommendations had implications for services locally and nationally", it said. HIQA added that the responsibility for compliance with standards rests with the provider of the services - the Health Service Executive or the voluntary hospital, and those charged with making policy, the Department of Health. It said that the regulatory system in Ireland "varies significantly" to those in place in other countries regarding reach, monitoring and enforcement. "The current programme, as funded by the Department of Health, merely allows for targeted monitoring in high-risk areas", it added. These areas include medication safety, antibiotic resistance, infection prevention and nutrition and hydration care. HIQA says it has the power to monitor public acute hospitals, against nationally mandated standards and these are publicly reported on. Its 2012 statutory investigation report into the emergency department at Tallaght Hospital, criticised the hospital, saying patients' lives were being put at risk because they were being treated on trolleys in corridors. That report said that all hospitals should stop using hospital corridors, or parking areas for trolleys, to accommodate patients receiving clinical care. It also suggested that no patient should spend more than six hours in an emergency department.